DESCRIPTION: 3M recommended for exposures to organic vapors and mists commonly associated with spray painting, lawn and garden pesticides, pharmaceutical, staining or refinishing decks and hardwood floors, and many other applications. 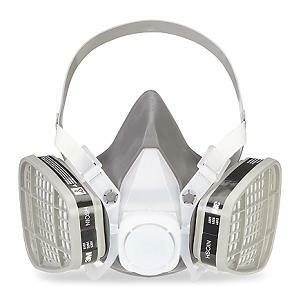 Dual Cartridge Disposable Respirator. Made in USA by 3M Brand. Low profile design provides wider field of vision and greater comfort while wearing goggles or glasses. Lighweight, well-balanced design provides greater worker comfort.